Last Sunday the Old Harbour Primary School hosted a special evening of music, dance, comedy sketches and storytelling. The event was to celebrate the school’s growth as a leading local educational institution from its humble beginnings over a century ago. Performers included local business and community leaders, students, and residents. Teachers from the host school and others nearby in St Catherine were there on an unusually chilly evening. The MC was Denise Wright from Love FM which streamed some of the performances live on their radio station. A number of special guests were present including former vice principal Mrs Valda “Scorpion” Green and former principal Mrs Mavis Cohen who started her teaching career at Old Habour Primary in 1948 and remained there until she retired in the late 1980s. The highly respected drummers from the local chapter of Portmore Community College kicked off the evening with an energetic performance of African/Rastafarian influenced rhythms. Two comedy sketches were performed by teachers from the host school and Planters All Age. Local resident Andrea Wright aka comedy character Delcita also performed but without the usual dark make-up. Andrea also had a serious message for parents and warned them to monitor their children’s mobile phones and internet activity. My favorite performance of the evening was the gospel singing of a Miss James – a teacher from Bartons School – who took the mic and promised the audience they would get their money’s worth. This she did with a upbeat style reminiscing of a late night set-up (wake). We also had performances by teachers from Tacius Golding High and Old Harbour Bay Primary School. The business community was represented by the local icon Joseph “Torm” Parker and the couple from Vicky’s Pharmacy who sang a romantic duet. Overall a wonderful evening as the school continues to enhance it’s reputation at all levels. Old Harbour Primary has come long way from its inception. 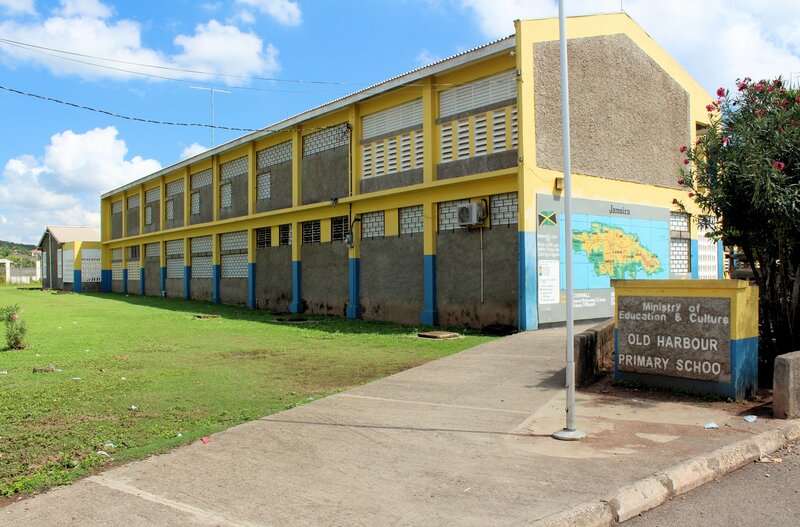 Old Harbour Primary started as a result of a bequeath in 1875 by former magistrate Thomas Ludford – as described by a letter in the Kingston Gleaner from 1922 by Rev W Clarke-McCalla. The school – then known as Ludford Market School Trust – became a government school in May 1902. In those days the school only recruited teachers who were qualified and members of the Church of England. Old Harbour Primary head-teachers from those early days includes Simeon Cornelius Thompson (1900-1918) H A Reid, C.T. Lewis (founding member of 4-H clubs), Stanley Blair, Donald Nation (grandfather of renowned Canadian writer Malcolm Gladwell) through to Mable Grandison, Mrs Mavis Cohen down to Linnet Lewis-White have all played their part in developing the school. Dr Heloise Lewis (wife of C.T. Lewis) also spent her earlier teaching years at Old Harbour Primary in the 1930s/1940s. Dr Lewis went on to become the leading Spanish teacher in the English speaking Caribbean and wrote numerous textbooks including Vamos Amigos. 1974-1979 I passed through the school as a student during the Mavis Cohen era. My dad went there in the 1930s. This was the first time this type of cultural event was hosted by Old Harbour Primary. I am already looking forward to next year’s gig. This entry was posted in jamaica, jamaican, old harbour, old harbour bay. Bookmark the permalink.